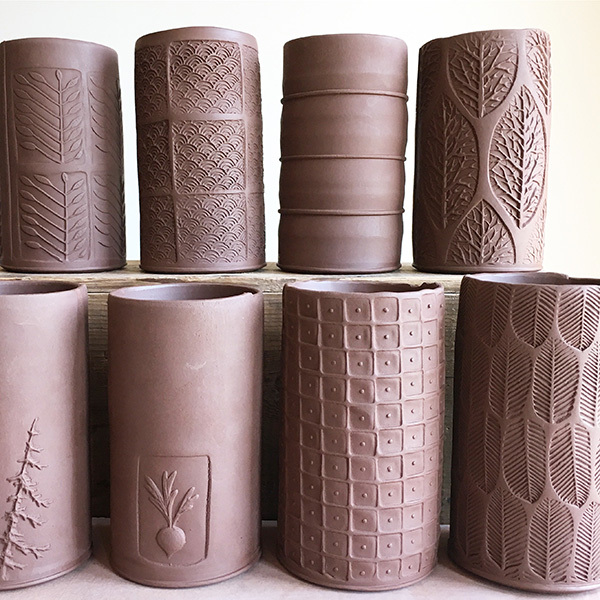 If you love the act of stamping texture into soft clay, this video is for you! Sarah Pike shares her techniques for creating beautiful slab built vessels with unique custom textures and designs. Not only does Sarah reveal her streamlined slab building techniques, but she also shares how to make the texture tools she uses to create one-of-a-kind designs. 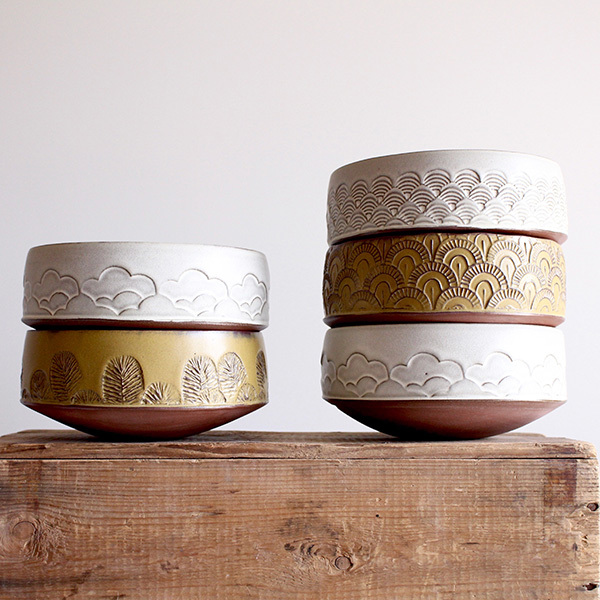 Sarah Pike is a full time potter living and making pots in Fernie, British Columbia, Canada. 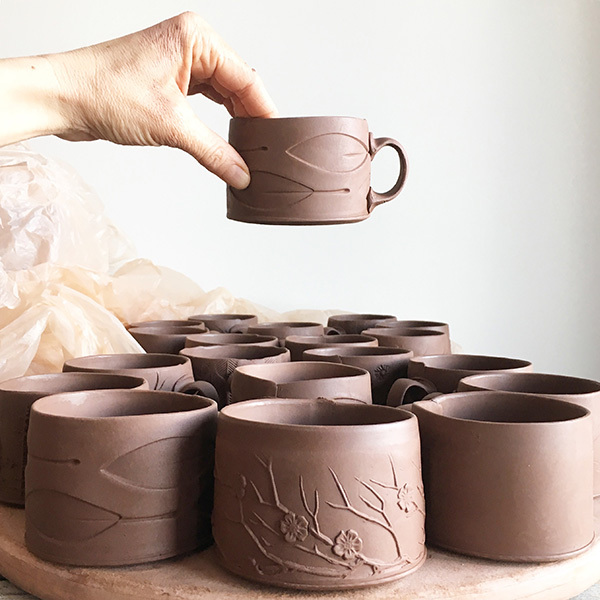 She makes functional slab-built pottery in her home studio on a an acre of land on the edge of a little ski town. She majored in ceramics at the Alberta College of Art and Design in Calgary, Alberta, Canada. She then studied at Colorado University in Boulder, and went on to do graduate studies at the University of Minnesota in Minneapolis. Along the way, she started a family, lived in a barn, and helped run her husband’s family ranch. Currently, Sarah lives in a renovated old mining house with her husband, two kids, and a dog named Lily. 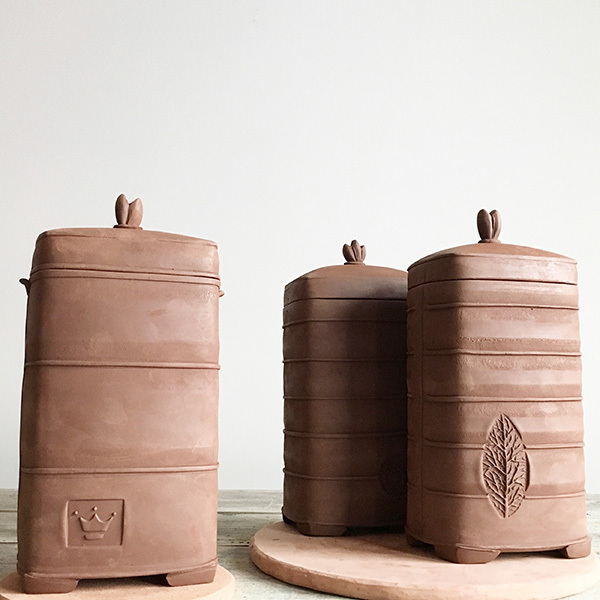 Sarah Pike’s pottery is inspired by many things, including the landscape around her home, the rich history of ceramics, but also by antique tinware, textured metal, and old things you might find in barns. Hi! I bought a membership to this community based on Sarah’s teaser video. I’ve made my own texture rollers but I’ve had difficulty with glazes obscuring my raised texture. I’m sure her glazes are her own and I’m not looking for the exact glazes but just tips for finding the right glaze to enhance my texture. Should I be looking for matte glazes? Loved Sarah’s technique and add me to the brayer love. Sarah, your mastery of your process is so apparent. You make it look so simple, yet it is clear that there have been many iterations and your work continues to evolve. Thank you for providing clarification about the purpose of each process. I find your pottery to be quite engaging (particularly the trees). Good luck with your practice. I’m getting no sound on the flared mug segment. Just me? A lovely video. I don’t see any recipes. Are they supposed to be included? I love your work Sara. It’s so beautiful. Such lovely work. In the interview I found myself nodding throughout and recognizing myself in your story. So grateful for your transparency, your honesty about the darker side of becoming a parent and how it affects our dreams. Carry on! Stunning. Is low fire clay? Great interview Sarah. You’re always so inspiring. Fernie is lucky to have you!